Fragrance has the power to transport you somewhere in an instant! With the launch of our new scented soy candles this week, we wanted to give you a bright insight into them! Soy wax, made from soya beans is sustainable, eco friendly and has a cleaner, longer burn time than traditional petroleum based paraffin candles. This means there is no soot and you can enjoy your soy wax candles for generally 30-50% longer than a traditional paraffin candle! Did you know that our new soy candles are handmade by us in York? From the hand application, fragrance testing and the trimming of wicks to the expert precision of placing our labels on the recycled glass. All of our candles are made in small batches and each one is created with love and care for you to enjoy! Finding candles that are totally free of nasties can be tricky. At C&W we only use the best quality- we use 100% natural soy wax and infuse it with a blend of premium fragrances and essential oils. We also use natural unbleached cotton wicks to ensure a safe, clean burn. We think that there is nothing more intimate than candlelight. Our candles are designed to soften the ambience and create a relaxed, cosy environment. - HOW DO I USE MY C&W CANDLE TO ACHIEVE BEST RESULTS? When lighting your candle for the first time, allow the wax to melt to the sides of the jar, ensuring a consistent burn. We recommend the maximum burn time is around 3-4 hours per burn. Please remember to always trim the wick after each burn by cutting off the burnt ends when cooled. To uplift, to wind down, or to simply add an air of luxury! It’s like having a fresh pot of garden mint in your home! A combination of peppermint and spearmint, infused with a hint of white tea. The perfect candle for your kitchen! Take a trip to the Mediterranean and sit beneath a sun-warmed fig tree. Blended with top notes of fresh fig, succulent cassis and cherry, with base notes of patchouli, cedar, amber and musk. The perfect year-round elegant scent. An intoxicating fragrance- think of the roaring twenties in a New York Jazz Club! 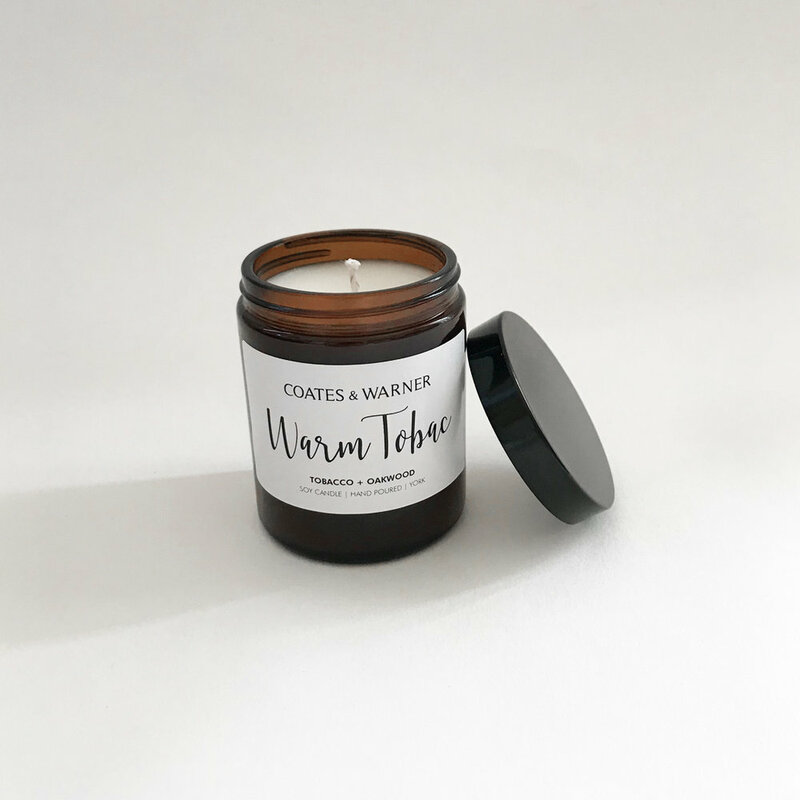 This soy wax candle has a warm blend of seductive smokey oakwood and sweet tobacco base notes, enhanced by leather, spice and musky top notes. A sophisticated scent dominated by a creamy blend of fresh raspberries, cherries warmed with pink and black peppercorns and intertwined with a plethora of transparent flora, underscored with creamy musks. Immerse yourself in this gentle floral fragrance blended with mimosa extract. With hints of violet leaves, cardamom and a touch of cucumber. Mimosa and muguet create the heart of this fragrance, completed by a base of musks, vanilla, smooth sandalwood and heliotrope. Inspired by the traditional charms of Southern France, you will Warm, ethereal, mesmerising. Or perhaps you would like one of our larger candles for a longer burn? CLICK HERE to view our larger jars!